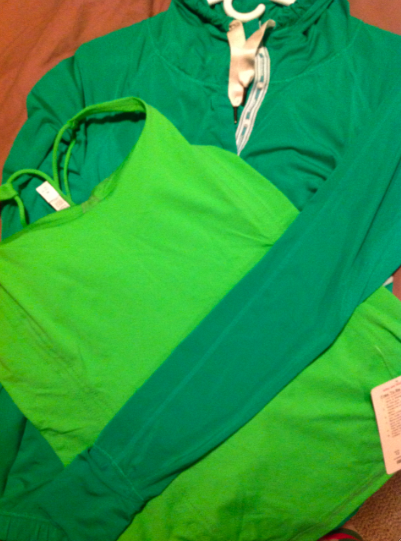 How sad that the last true mid tone green that Lululemon came out with to compare Frond Green with was in summer 2010! I really wish lululemon would come out with Savage again, or a very similar Kelly Green. That said, I LOVE Frond. I especially love it next to Savage. I’ve been told that we will not see a solid Frond CRB (just Gingham and upcoming Ocean stripe Frond/White) so I opted to grab the saturated Free To Be Tank and later caved and got the Energy Bra too. "More Pictures Of The Latest: Run: Rise And Shine Jacket in Frond, Run: Pace Tights, Scuba Hoodies and More"
"The Latest: Run: Warm Up Crew, Energy Bras, Surf Bonded Cool Racerbacks and More"